There is an immediate mess to be cleared up at the BBC but then it needs longer term restructuring. There is a fairly superficial job to be done on getting the right people in the right posts, but then there is the deeper challenge of changing culture. When Mark Thompson left I wrote that the BBC desperately needed an outsider who would challenge the structure and culture of the organisation. Instead it got lifetime BBC careerist George Entwistle who wanted reform, but thought you could do it by gentle persuasion. He lacked the personal authority, managerial grip and strategic vision to make it happen. So the next leader will be crucial. And, by the way, if you want to attract a top person from outside, you might even have to pay them more than was on offer before. But please, don’t give them a half million pound pay off plus a sumptuous pension if they screw up. However, the BBC is so vast that we can’t expect one person to do it on their own. The most revolutionary DG of recent times was John Birt who brought in his own people to infect the BBC with novel ideas such as proactive management, accountable budgeting and rational journalistic process. Birt was much derided at the time for the jargon and his total lack of Greg Dyke-style charisma. But he saved the BBC from Mrs Thatcher’s wilder ideas of privatisation, set it on the path towards digital dominance, and put an expanded news service at the heart of the corporation’s global offering. But here’s the paradox, that team then needs to set out clear lines of communication that return day to day power to the programme teams. 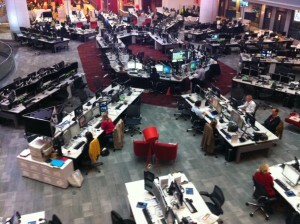 The integrated newsroom makes a lot of sense in terms of efficiency and the multi-platform Internet age. But responsibility needs to return to the front-line. Anyone who has worked at any other broadcaster apart from the BBC will tell you of the joy of working in a system where you are only ever one step away from the public and one step away from the boss when a decision needs taking. I hope whoever comes in will learn lessons from places like Sky or the hugely improved ITV news. I also hope they look abroad and not just to the English-speaking world. The BBC has rested on its reputational laurels for too long. Go see the elements of excellence in places like Al Jazeera, Swedish Radio, and even NPR. For too long BBC top brass has lectured everyone else about its virtues instead of looking to learn lessons. A bigger task is also to address the governance of the BBC. I still don’t quite get what the BBC Trust does. Personally, I don’t think Chris Patten is the right person – he acts as if he runs the BBC and doesn’t appear open to criticism from outside. He chose Entwistle, after all, and made some misjudgements himself. He is obsessed with a hatred of all things Murdoch which deafens him to legitimate criticism. But whether he stays or not (I can’t see him being prised away) I thought the Trust was supposed to be a strategic overseer and the champion of the viewer. This might be too contradictory a role. It may be that we need Ofcom to hold the BBC to account and the Trust to revert to being a board that supports the DG. Across Europe and beyond, public service broadcasting is coming under economic and political pressure. Yet at a time when much commercial news media is also feeling the strain we need it more than ever. With an Internet filled with garbage we need the BBC to provide the option of trustworthy, balanced, informed journalism. PSBs correct market failure, but when they work well, like the BBC, they provide so much more. Don’t just think of the extraordinary coverage like the Olympics or the outstanding reporting of the financial crisis by a great correspondent like Robert Peston. Think also of the daily local news bulletins, CBeebies or the amazing online archives. The BBC is too big. But this isn’t just about size. Yes, it might need to stop doing some things and employ fewer people. But it should also become much more open. It should be a resource for others including rival news organisations. It can devolve or outsource much of its work. It’s time for networked management not a hierarchy. Strong leadership, but devolved responsibility. This isn’t just a Nu Meeja slogan, it’s the way most major corporations and third sector organisations are going in the modern age. The health and education systems are being reformed, why not the BBC? Sadly, some of the above was on George Entwistle and Chris Patten’s agenda. They spoke of ‘removing silos’ for example. (Oh what irony to use such jargon to describe the exact problem that brought him down). The fact that he probably wasn’t the person to put reform into practice may have had the result of making the need for reform even clearer. These are my rather vague opening thoughts. I would be very interested to hear your ideas and please send me links to other articles about broadcasting reform. Excellent diatribe by Jenni Russell who correctly identifies what I called a closed culture and what she calls a ‘yes man’ culture. As Jonathan Marks points out in his blog – this crisis isn’t just about the BBC, The Bureau of Investigative Journalism is also in the firing line.